This week's Deal of the Week is the AT&T GoPhone Microsoft Lumia 640 Windows Phone on sale for $29.99 at BestBuy. Priced at $79.99 when it launched nine months ago, the Lumia 640 is generally considered the best entry level Windows phone to date. It features a 1.2 Ghz quad core Snapdragon 400 processor, 5 inch 1280x720px HD Gorilla Glass 3 screen, 1 GB RAM, 8 GB internal memory, support for SD cards up to 128 GB and a removable battery. There's an 8 MP main camera with auto-focus and flash and a 0.9 MP front-facing camera. 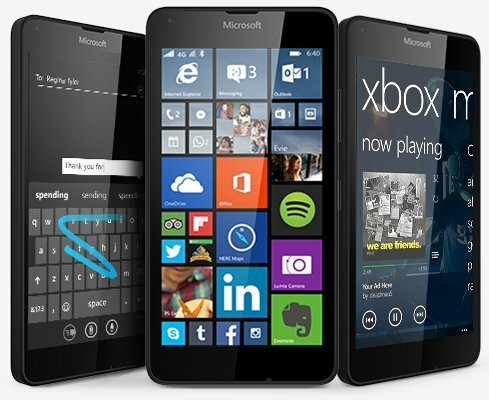 The Lumia 640 ships with Windows Phone 8.1 with an update to Windows 10 expected soon. The GoPhone Lumia 640 works out of the box on AT&T, Cricket and all AT&T MVNOs. If unlocked it also works on T-Mobile and T-Mobile MVNOs. Boost Mobile LG Volt 2 LTE Android phone for $66.99 (reg $79.99) at Amazon. T-Mobile LG Leon LTE Android phone $69.99 with free $40 airtime card (reg $179.99 w/o airtime) at T-Mobile. TracFone LG Sunset (AT&T) LTE Android phone with 1200 minutes, texts and MBs of data, one year of service, case and car charger $99.95 at HSN. TracFone LG Ultimate 2 (Verizon) LTE Android phone with 1200 minutes, texts and MBs of data, one year of service, case and car charger $101.96 (reg $129.99 w/o airtime) at HSN. Discounted phones for port-ins: ZTE Sonata 2 99¢, LG G Stylo $59.99, ZTE Grand X Max+ 79.99, Samsung Galaxy Grand Prime $29.99, LG Risio $19.99, HTC Desire 520 $29.99, HTC Desire 626s $29.99 and Alcatel OneTouch Idol 3 $109.99 when you port your number to Cricket. AT&T customers excluded. Ends 3/17. Unlocked GSM iPhone 5 16 GB (manufacturer refurbished) $159.99 Free shipping. Verizon (or PagePlus) Samsung Galaxy S4 I545 LTE Android phone (new) $149.99 Free shipping. Verizon (or PagePlus) iPhone 5s 16 GB (manufacturer refurbished) $239.99 Free shipping. Verizon (or PagePlus) LG G3 VS985 32 GB Android phone (new) $277.77 Free shipping. Verizon (or PagePlus) Samsung Galaxy S5 SM-G900V 32 GB LTE Android phone (new) $279.95 Free shipping. TracFone LG Lucky (Verizon) Android phone with 600 minutes, texts and MBs of data, 90 days of service, case and car charger $50.96 (reg $59.99 w/o airtime) Free shipping. TracFone LG Sunset (AT&T) LTE Android phone with 1200 minutes, texts and MBs of data, one year of service, case and car charger $99.95 (reg $99.99 w/o airtime) Free shipping. TracFone ZTE Quartz (Verizon) LTE Android phone with 1200 minutes, texts and MBs of data, one year of service, case and car charger $84.96 (reg $99.99 w/o airtime) Free shipping. TracFone LG Ultimate 2 (Verizon) LTE Android phone with 1200 minutes, texts and MBs of data, one year of service, case and car charger $101.96 (reg $129.99 w/o airtime) Free shipping. Straight Talk Free overnight shipping on phones $29.99 and up, ends 2/16. Samsung Galaxy S6 LTE Android phone $299.99 refurbished. Samsung Galaxy S6 Edge LTE Android phone $349.99 refurbished. Tracfone Free overnight shipping on orders of $19.99 or more, ends 2/16. Walmart Online Now Free shipping on orders over $35. Ship to store free. Updated 3/11: New FreedomPop deals. Dennis, glad to see you are back. Hope your vacation was fantastic!! LG Tribute Duo is a good deal from Sprint. Cheapest I've seen from Best Buy was $60. It's a good phone for R+. Damn Dennis! Back at it again with the best deal of the week! First of all, welcome back Dennis! We all missed you and the great service you provide. My personal favorite that I'm using on TF now is the Motorola Droid Turbo. You can get a good one on eBay for under $200. Paid $170 for mine in mint condition. And pay your first month of fi ,correct? Does anyone here know if a new straight talk 3G CDMA verizon phone can be activated on tracfone (existing tracfone customer, not new customer)? Thanks! Straight Talk phones can not be activated on TracFone. Can verizon iPhone 5s be used on Tracfone? Hear Apple is about to cut price of iPhone 5's in half, to about $225 when the new iPhone SE comes out in another week is so. When the price is cut by apple, Where can I buy a new Verizon iPhone 5s that I can put on Tracfone? Would this be a good cdma phone for Tracfone? Or is Android better? Please show the source of the info on the dramatic iphone 5s price cut. It's Apple, I would be surprised if the price drop is more than $50. "Best Buy Outlet is offering a coupon to all CowBoom customers from March 10 12AM CST to March 12 11:59PM CST with the following promo code. Save $10 on any open-box purchase $100 or more*. When does the Kroger 300 fuel points deal on tracfone/net10 purchase end? I'm in a phone but that would make it a very sweet deal if it's not already expired. The 300 fuel points promotion appears to have ended already as it's no longer on the Kroger site. Boost Mobile: My Local Boost Stores are Now selling the Boost iPhone 5s for closeout price of $99.99.